Choosing the best combination belt and disc sander can be difficult if you are not sure about what you need it for or not familiar with the features you need to look out for. Belt and disc sanders are versatile and worth investing in if you find the right one. We put this review together to help you figure out which sander best serves your needs. Moreover, we listed some of the best belt and disc sanders on the market today. Whether you are a busy contractor or a humble basement DIYer toiling away on home renovation projects, you will find combination belt and disc sanders highly useful. From prepping surfaces to removing rust and paint and doing final finishing work, these workhorses have got you covered. Once you find the right combo sander, there is simply no looking back. You will wonder why it took you that long fumbling for several different sanders and other tools when one equipment can do it all. We like Rikon’s 50-151 because of the value it gives. Sure, it is a little bit on the pricey end, but there is a good reason for that. It runs on an efficient, high-performance induction motor that can take on hours of detail sanding and repair jobs with absolute ease. The 50-151 is designed to be very compact, so setup and storage should not be an issue. It is also solidly built, having a cast iron base with rubber feet and a metal body that protects its inner parts from the elements, damage, and daily workshop abuse. Indeed, the 50-151’s performance more than justifies the fact that it will set you back a few hundred dollars. The RK7866 is easily one of the best horizontal sanders you will find today. It is very sturdily constructed and comes with a very flexible belt that can be used at odd angles and narrow spaces. The RK7866’s dust ports do an excellent job of keeping the work area tidy and improving visibility. Its motor works relatively quietly too, which is partly why many woodworkers have come to admire this machine. This belt and disc sander from Rockwell is so well-built and well-engineered, it will surely last a long time even with heavy usage. Powertec’s BD1500 is specially designed and constructed for handling big batches of small sanding work seamlessly. Although this combo sander will do fine if you decide to try it on heavy-duty operations, it produces the best results on furniture and similar projects. The design takes advantage of aerodynamics well and uses it to enhance its performance and finishes. The good thing about it is that the BD1500 offers all of these benefits for such an affordable price. A combination belt and disc sander accomplishes a wide range of tasks--from preparing wood surfaces for varnishing to removing rust or hardened glue and smoothing out patches. 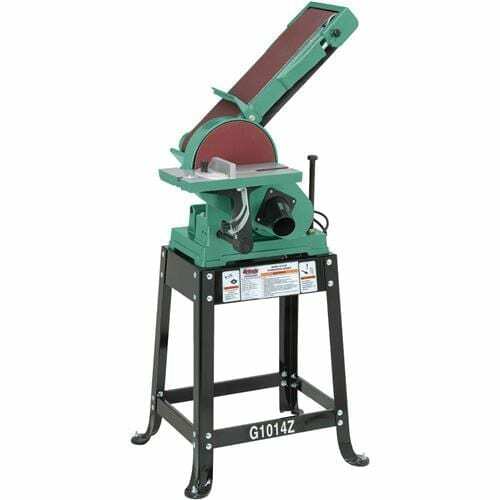 If you are the type of worker who deals with such operations heavily on a daily basis, a combo belt and disc sander is definitely recommended for you. To be more specific, the belt sander is ideal for jobs that require the removal of a lot of material quickly. It is the sander you need to use when stripping paint or finishes or getting rid of rust. On the other hand, the disc sander, which produces a smoother finish compared with the belt sander, is ideal as a final finishing tool. Combo belt and disc sanders quickly grew in popularity after the first few models came out a while ago. This is a good thing because it gives you a lot of options. The downside is that being faced with a long list of options can be confusing and sometimes makes decision-making even harder. To help you decide on which model to get, here are some of the things you need to look for when shopping for combo sanders. Although it is always best to use a machine with a power that matches your operation just right, it can’t be avoided that you’ll be off from time to time. In that case, remember that it is always better to use an equipment with too much power than one with too little. When working on carpentry, repair, or home renovation projects, the last thing you want is a broken down sander and a half-finished workpiece. Combo sanders are already versatile by nature. However, manufacturers have found ways to make these machines even more useful for an even wider range of tasks. Look out for tilt angles, add-ons, number of work tables, speed control, and so on. The more adjustable a combo sander is (also, the larger the disc and the thinner the belt), the more tasks it can do. Dust is your worst enemy when sanding. Aside from being a pain to clean up, they affect visibility. You want a combo sander with a spacious cloth bag that attaches well so that it can collect most (you can’t really expect it to collect all) of the dust. Most sanders today come with many convenient features that improve ease of use and maintenance. For example, tool-free belt change mechanisms have become quite common. So are dual dust ports and similar features. Wen’s 6502 definitely means business. It has a heavy cast iron base, a 4 in x 36 in belt, and a 6 in disc. It has a conveniently designed and located tension release lever that allows you to change the sandpaper without having to use tools. Because of this feature, you can also use different grits and grades. The workbench has a swiveling miter gauge with a range reaching 45 degrees. The dust collection port is quite roomy, measuring 2.5 inches. The whole unit weighs about 40 pounds, which is what you really need in a sander like this. The belt can be tilted up to 90 degrees, which will help a lot if you need to do some flush sanding. The cast iron base is heavy, durable, sturdy, and not to mention, stable. Aside from keeping the sander steady during heavy sanding operations, this base helps reduce vibration, which can negatively affect the sanding quality and make you even more exhausted than you already are. The lever allows you to change sandpapers for the belt and the disc. In some old models, changing sandpapers require actual work and a few minutes of downtime. This tension release lever resolves that and makes sandpaper changes the easiest they have ever been. The blade guard helps direct sawdust into the collection spout and acts as a stopper for your wood. More importantly, though, this extra long blade guard keeps hair, fingers, sleeves, and other items from getting caught in the belt. The belt can be used horizontally, vertically, and every other angle in between. This is good news if you have some flush sanding work lined up. This combo sander from Grizzly is optimized for light-duty sanding jobs. It is light, weighing just a little over 20 pounds. However, its ⅓ HP motor packs a good amount of power and runs at 3,450 rpm. Both the belt and the disc sanding tables can be tilted up to 45 degrees, which should take care of difficult corners but not flush sanding. Moreover, it is designed to minimize vibration. The H6070’s lightweight body makes it portable enough to be moved from one work site to another with ease. If you fear that its lightness may make it unstable for long hours of sanding, you can use the holes punched into the base to secure it. Although the H6070 is not an all-metal sander, its plastic parts are made of quality reinforced plastic that can withstand heavy usage and wear and tear. 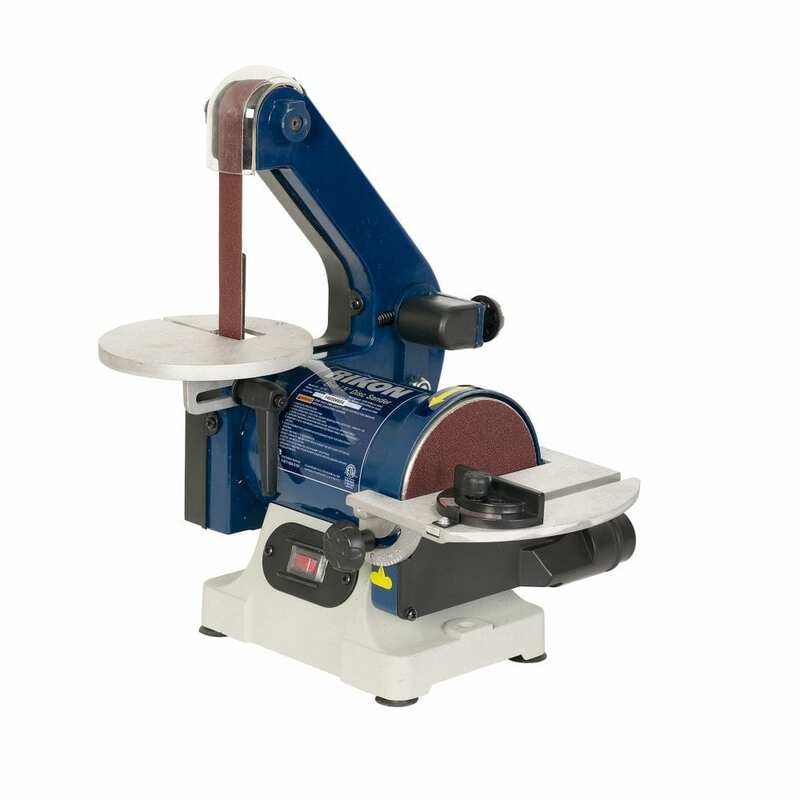 With proper maintenance, this combination belt and disc sander should last you a long time. The BD1500’s 2.5-amp induction motor with ⅓ HP is just the right motor for the hobbyist. The disc measures 5 inches and the belt measures 1 inch x 30 inches. The no-load speed of the motor is 3,450 rpm, which works quite efficiently. Powertec aims to make sanding angled surfaces a little easier by making the BD1500’s tables tiltable up to 45 deg. It has a belt tracking system, two dust ports, and a removable back plate and roller guard. The knobs on the BD1500 are adjustable and removable, allowing for easy maintenance care, cleaning, and repair if needed. There is a tracking mechanism installed in the BD1500, which you can use to make sure that the belt runs properly and does not shift out of place when sanding. The BD1500 has a fairly powerful motor that can endure long hours of sanding regularly without showing the slightest sign of wear and tear. It is also one of the quieter motors we have seen so far. 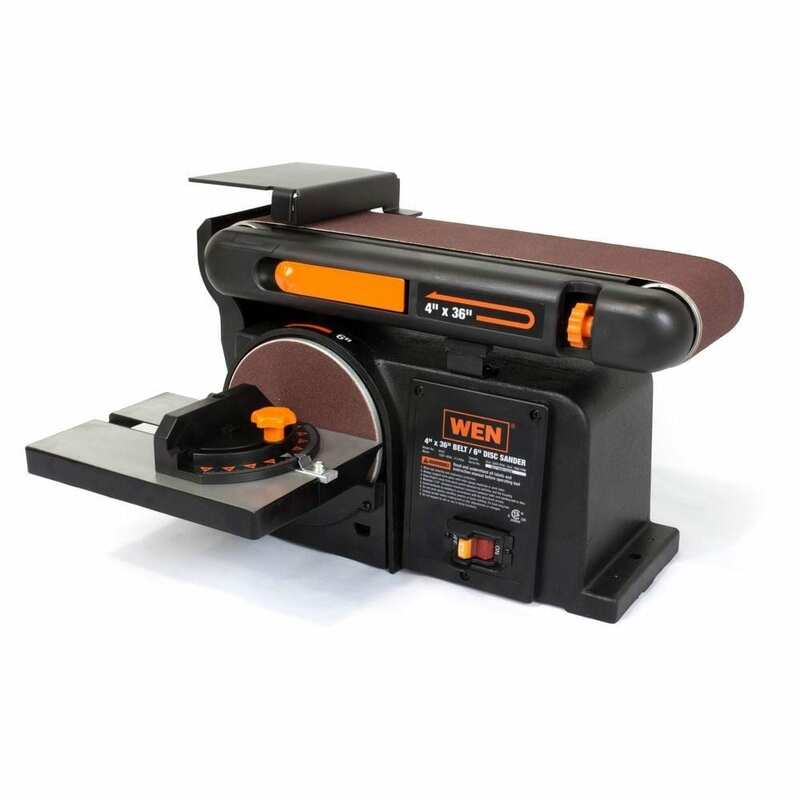 This combo belt and disc sander is made out of high-quality materials that effectively protect the sander’s motor and bearings from damage due to impact or contamination. The 50-151 is compact and can be placed along with your other benchtop tools to help you achieve the setup you need. Its body houses an incredibly quiet induction motor and comes installed with dual dust ports. However, what must be the best thing about the 50-151 is the heavy cast iron base that keeps it right in place no matter how jagged your sanding is going. Other features include tool-free knobs for table tilting and belt tracking. The cast iron base does a superb job of keeping this combination sander steady even when sanding for hours on end. Also, it helps the sander pull off heavier-duty work despite the fact that this model is optimized for lighter sanding jobs. The 50-151 is made of high-grade materials that protect its interior parts well and hold up nicely against the wear and tear that comes with daily sanding operations. Its motor, for example, is a brushless one that sits in a metal case, which means it is indeed designed to last a long time. Both tables are perfectly adjustable using easily accessible knobs. This feature allows you to use this combo sander for angled sanding and for sanding in narrow spaces. The belt itself comes with a practically designed tracking mechanism that keeps it in place and helps improve sanding precision. The induction motor running the 50-151 is amazing in that it manages to be extremely powerful while remaining fairly quiet. At the end of the day, of course, it is still a sander that will require the use of headphones for noise protection. However, this combo sander from Rikon is noticeably quieter than most other sanders available today. Rockwell’s RK 7866 comes with an aluminum work table that is as sturdy and stable as it is lightweight and can be tilted up to 45 degrees. It also comes with a miter gauge, which greatly improves efficiency and sanding quality. The whole unit weighs a little over 45 pounds and runs on a high-performance ½ HP motor. The RK7866’s belt tension feature is easily adjustable using a simple quick-release lever, allowing for fast and simple belt changes. This kind of feature greatly reduces downtime and not to mention, frustration. Aluminum is known for being strong and durable despite being lightweight. The RK7866’s aluminum work table can handle regularly sanding even heavy materials provided it is maintained and cared for properly. This combo sander’s 4 in x 36 in belt and 6 in disc are more or less standard, meaning they are designed to work well for most sanding applications. Combined with the adjustable tables, the RK7866 gives you full flexibility in sanding. Most of the positive reviews talk about how much value this 2-in-2 sander gives for the money. It is full of features--big and small--that all contribute to superior performance and extreme durability. The fact that many of the buyers who left positive reviews on the 50-151 are experienced DIYers who have used different sanders before says a lot about the quality of Rikon’s belt and disc sander. There were a few negative comments, though. However, we were unable to notice any recurring pattern. There were complaints about defective parts or about the sander not working despite being new, but they seemed to be more like isolated cases. Overall, the 50-151 sounds like the perfect combination belt and disc sander for the busy DIYer or hobbyist who has a lot of sanding to do. Skil’s 3376-01 is a well-designed mid-range combo sander that is best used for light- to medium-duty sanding work. It runs on a 4.3-amp motor and has a speed of 2,150 feet per minute. The belt and the disc are standard, measuring 4 in x 36 in and 6 in, respectively. It is easy to assemble, maintain, and use. The work table rotates such that you can switch from the disc to the belt and vice versa. 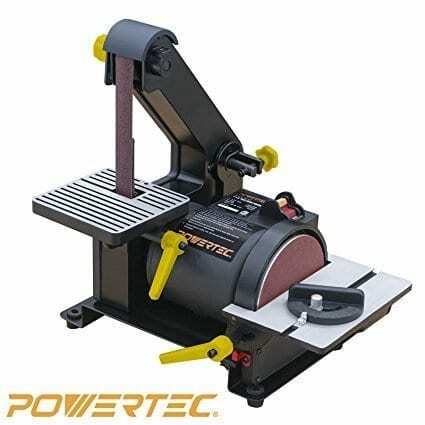 If you have a carpentry business and/or are simply willing to shell out for a quality belt and disc sander, we recommend that you go for the 1791291K Model 31A from Powermatic. It is entirely constructed out of cast iron, providing maximum stability for the heaviest sanding operations. It runs on an insanely powerful 1.5-HP motor and comes with neat features such as adjustable tables, a miter gauge, a head lock, and more. This combo sander from Central Machinery is a humble machine that offers the basics but performs them well. It has a dual-position table that can be tilted up to 45 degrees. The work table is easily rotatable for shifting between disc sanding and belt sanding. It also comes with a miter gauge, which tilts up to 45 degrees in both directions. It is sold with a floor stand, an 80-grit disc, and an 80-grit belt. The 50-122 is a little expensive, but for a good reason. It runs on a large and powerful 1-HP motor that can be used even for heavy-duty sanding without the risk of causing the motor to stall or break down. The disc table rotates up to 90 degrees, which is good news if your workpiece requires angled sanding or even flush sanding. The same goes for the belt, which can be positioned vertically or horizontally. This combination sander from Hico may be a good option if you need mid-range sanding on a modest budget. It has a cast iron base that provides stability, an adjustable belt that can be used horizontally and vertically, and a sanding table that can tilt up to 45 degrees. It also comes with a miter gauge, which is extremely helpful in maintaining precision when sanding. The J-4002 is a multitasker that takes a combination sander’s versatility to a whole new level. It has a dedicated part that can accommodate a flex shaft for accomplishing tasks such as carving and deburring. The high quality miter gauge installed can be turned up to 45 degrees both directions and has a convenient lock function. Finally, the J-4002 has an abrasive belt unit that can serve as a jigsaw or a file while finishing at the same time. Jet’s 708599K JSG-6DCK is another good option if you have lots of cash to spare for a sander. It operates on a 1.5-hp single-phase motor. Its belt can be tilted up to 90 degrees, which should take care of nearly every possible sanding requirement. In addition, the 708599K JSG-6DCK comes with layers of security features that help prevent accidental startups and other common accidents. This belt and disc sander from Grizzly is ideal for medium- to heavy-duty sanding operations. Its cast iron disc, body, and cabinet provide stability and support for heavy materials. However, such a construction means that the sander is understandably heavy. Position it in your shop where you can easily sand without anything getting in the way and you should be good to go. Looking at the W1676, it is evident that the manufacturer took every step to make sure that the sander is able to withstand thousands of hours of heavy usage. The body is made of high-grade reinforced material and is coated with powder-coated paint. It comes with two dust ports, a large belt, and a large disc. The 708595 JSG-96 is also a little on the pricey side. However, being a Jet product, it definitely justifies its cost. It can sand vertically or horizontally and has a cast iron table with positive stops at 45 and 90 degrees. The motor is a ¾-HP one, which can handle even the most difficult sanding operations without stalling. Instead of having separate belt and disc sanders, you should consider investing in one of the best belt disc sanders on the market today. We recommend RIKON Power Tools 50-151 Belt with Disc Sander because it comes with a lot of basic and advanced features that make both sanding and maintenance work easy and quick. It has a cast iron base, an all-metal motor casing, a powerful motor, and adjustable tables, belt, and disc. If you think this is the sander for you, click here to find out more about it.